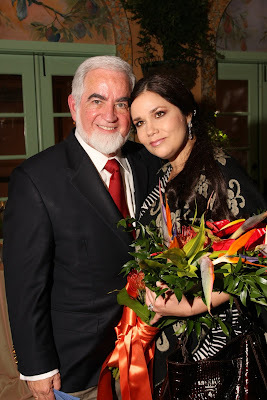 A few days ago, I managed to talk to Cuban-born soprano Eglise Gutiérrez during a lunch break about her thoughts in preparing for the role of Violetta and her experience of returning to Seattle Opera after her successful debut in her first Elvira in our production of Bellini’s I Puritani in May 2008. Concerning the role of Violetta, this is her third production of the opera in a year and a half, the others being at Cincinnati Opera and Florida Grand Opera. Every time she does the role she learns something new about the character. She has read Dumas’ novel, seen the Garbo movie Camille, and has read a great deal about that era. She also listens to other singers in the role and seems to learn from some of the Violettas of the past. There is always something new about this tragic figure. I asked her about what she does on her free time during her visits to cities in which she is performing: “Honestly, casi nada, almost nothing. After rehearsing six days in a row, I like to relax on my day off and do very little,” says Eglise. She has had the opportunity to visit wonderful places and especially enjoys Buenos Aires, Mexico City, and several cities in Italy. Last September she made her British opera debut at the Royal Opera in Covent Garden in the title role of Donizetti’s Linda de Chamounix and had a wonderful time exploring London. From Seattle Opera she goes to Dresden for five performances of Rigoletto (in the role of Gilda) at the Semper Opera, then to China for concerts, and in December the title role in Lucia di Lammermoor at Florida Grand Opera coinciding with the Christmas holidays, where she is looking forward to spending some time with relatives and friends in Miami. Above: Ernesto Alorda and Eglise Gutiérrez. Photo (c) Alan Alabastro. Check back next week when Ernesto writes about his recent conversations with Nuccia Focile, who sings Violetta in the Saturday and Wednesday performances.